We spent some time at the library over the weekend. While there, the boys got a prize for reading (thank you summer reading program), they played on the computer, and we picked up some videos to watch. Oh yes, and we got some more books to read. 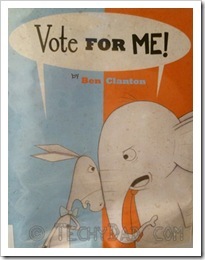 One of these books, Vote For Me by Ben Clanton, seemed at first to be a very typical kids book. I figured it would be full of colorful drawings, funny sayings and a moral at the end. Little did I realize that, in addition to the drawings, sayings, and moral, it would showcase just how the political process works. 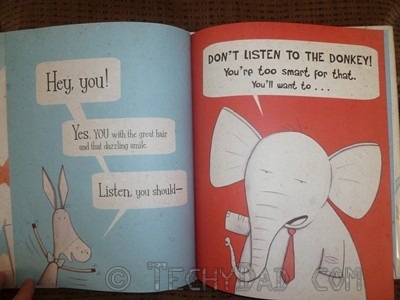 Both parties, the Donkey and the Elephant, begin the race mostly above the board. They try to appeal to the voters to choose them as the most fit for office. As they try explain what they promise to give to voters, if elected, the snipes come in more and more. Soon, it’s an all out mud-fest with names being hurled almost as much as mud. Oh sure, perhaps the names that grown up politicians use aren’t "smelly pants" or "snot-sucker", but let’s be honest, they may as well be. 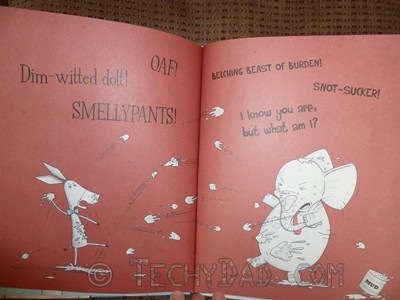 This is definitely a good book to read to kids, but I don’t think we should stop there. This book should be required reading for any politician running for public office. Then, when they decide to engage in some mud slinging, they can be sat down, forced to show just what page they were copying, and told to sit in a "time out chair" until they apologize to their opponent. Oh, who am I kidding? 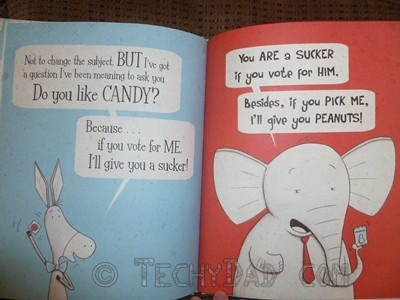 They’d probably read the book and find a way to call their opponent a "snot-sucker." Let’s stick to reading this to the kids. At least they have a shot of learning the book’s moral. Want to learn more? 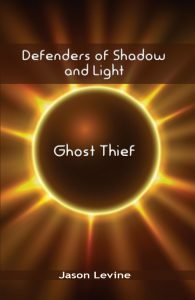 Head on over to B’s post today about the very same book. I promise we won’t be slinging any mud between us.